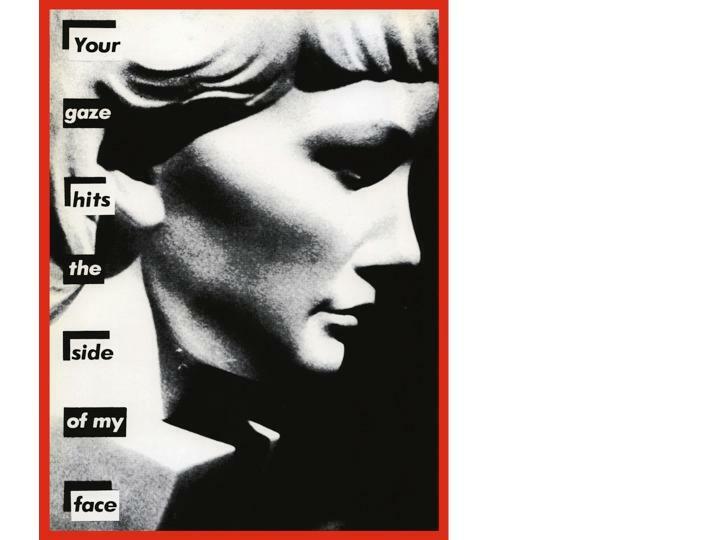 Barbara Kruger’s body of work is politically charged and poignant, with the former half of her career involving many works with feminist overtones through the processes of re-photograph and appropriation. She was among a preeminent group of female artists in New York who sought to connect fine arts to low culture in an age of mass media. Untitled (Your gaze hits the side of my face), one of Kruger’s most referenced works, is very indicative of her influences from her job experience, her mentors, and the social politics of her time. (untitled) your gaze hits the side of my face. 1981. barbara kruger. Kruger was born in 1945 to a working class family in Newark, NJ, but quickly became an insider of the elite art world (Drohojowska-Philp). Her working-class roots put her on the side of the consumer in terms of mass media and mass culture, which were booming during her formative years. Growing up in this context, Kruger was influenced to create art that the average person could view and interpret freely. Her work is blatant, easily digested and doesn’t require prior knowledge to understand through her appropriation of familiar imagery and simple word choice. Furthermore, the reproducibility of her art increased the actual circulation of her art. Instead of being exclusively placed on museum walls, a working-class citizen could buy a coffee mug with her work on it. A low culture appreciation for a work cannot diminish a that work’s importance if the point of the work is to be appreciated in low culture terms. In this manner, her work could be considered feminist propaganda. After enrolling at Parsons School of Design in Syracuse, NY, she studied under Diane Arbus. Arbus was an American photographer and writer specializing in black and white photographs of people on the fringes of normalcy (Spears). She also studied under Marvin Israel, a former art director for Harper’s Bazaar. Once she left Parsons, she began working at Mademoiselle Magazine in 1966 as a page designer (“Barbara Kruger”). Kruger essentially piecemealed her artistic style from these three experiences. Arbus’s influence over Kruger is naturally in the realm of photography, and the former half of Kruger’s work is almost exclusively photographical appropriation. However, the process of Kruger’s appropriation was deeply rooted in her time with Israel and Mademoiselle Magazine. Her work could just have easily been printed in a serialized, editorial format as placed on a museum wall. At the work’s inception, Kruger was unable to afford color prints, so the imagery she found from magazines were converted to black and white when she began to appropriate them. The art world was also experiencing the revolutionary process of mechanical reproduction. Walter Benjamin once wrote “...the work of art reproduced becomes the work of art designed for reproducibility.” Kruger was completely cognizant of this mechanization of reproduction, and through her use of someone else’s photography, she confronted the issues she was so passionate about in a manner which was entirely reproducible. Her work was then featured and reproduced everywhere - coffee mugs, t-shirts, magnets, posters, shopping bag, and buses. Kruger’s utilization of the newfound reproducibility of art was caused by a shift in what was considered the “medium” of a particular work of art. It was no longer important how or where the art existed, because it could be reproduced anywhere and on anything. Together with her East Village peers like Richard Prince, Kruger sought to define her work through audience interpretation, not by personally obsessing over the work itself. In Kruger’s case, her medium was appropriation and with it, her art was cerebral. It was within the ‘canvas’ of appropriation where she took someone else’s photograph, added text, and welcomed “the female spectator into the audience of men,” (Kamimura). Kruger was incredibly influenced by feminism. She believed that “any discourse or any political movement which does take feminism into consideration is complicit,” and her early works like Untitled (Your gaze hits the side of my face) live and breath this mantra (Kamimura). Her rejection of misogynist ideals is exquisitely constructed in this work, through the appropriation of the photograph of a sculpture as a female-gendered object. The object, contextualized by the added text “Your gaze hits the side of my face” and actually placed within the self-referential context of ‘being art’ is indicative of art’s shift from “ritual to political” (Kamimura). Combating the objectification of women within this work opens up a discourse on what women could be, if not a sexual object to be hit by a man’s gaze. To this end, Untitled (Your gaze hits the side of my face) leaves the discussion open-ended, allowing the viewers to decide for themselves what women could be, showing the extent of feminism’s effect on her work. (untitled) i shop therefore i am. 1987. barbara kruger. Barbara Kruger is very much a product of her time, rather than a reaction against her time. Even considering her as a member of the postmodern movement, she is more concerned with operating within her own stringent doctrines of feminism and appropriation to tell a sociopolitical story than engaging in a reaction for the sake of it. In Untitled (Your gaze hits the side of my face), she sought to create her own personal yet universal language of transformation through imagery framed in text. Kruger lifts her experiences from her time in magazine design and influences from Diane Arbus’s cerebral photography and places them in the realm of high art as an amalgamation of image and text in a time of burgeoning mass media and art reproducibility. This amalgamation represent her own language, her medium of appropriation, and rejects the misogynist society in which the work is forced to exist. "Barbara Kruger." Encyclopædia Britannica. Encyclopædia Britannica Online Academic Edition. Encyclopædia Britannica Inc., 2013. Web. 22 Sep. 2013. Drohojowksa-Philp, Hunter. "She Has a Way With Words." Los Angeles Times. Eddy Hartenstein, 17 Oct. 1999. Web. 23 Sept. 2013. Kamimura, Masako. "Barbara Kruger: Art of Representation." Woman's Art Journal 8.1 (1987): 40-43. JSTOR. Woman's Art Journal. Web. 23 Sept. 2013. Spears, Dorothy. "Resurgent Agitprop in Capital Letters." New York Times. New York Times Company, 24 Aug. 2010. Web. 23 Sept. 2013.